Viking Ship & Rune Embroidery. Fairy of the Glen, Bluebell. Fairy of the Glen, Christmas Fairy. Fairy of the Glen, Lavender. Fairy of the Glen, Lemon. Fairy of the Glen, Moss Green. Fairy of the Glen, Peach. Fairy of the Glen, Sugar-Plum Pink. Lantern Nisse on Mushroom 14cm. Lantern Nisse on Mushroom 17cm. Lantern Nisse on Mushroom 21cm. Nisse High Hat Bottle Opener. Nisse High Hat Snow Globe. Salt & Pepper Nisse on Mushroom. Blomkvist. Red Cap/ Grey Hair. Blomkvist. Red Cap/ White Hair. Bridal Couple. Vickan & Danne. Grankvist. Red Cap/ Grey Hair. Grankvist. Red Cap/ White Hair. Grankvist. White Cap/ White Hair. Skaggtomte Large. Grey Cap/ Grey Hair. Skaggtomte Large. Grey Cap/ White Hair. Skaggtomte Large. Red Cap/ Grey Hair. Skaggtomte Large. Red Cap/ White Hair. Skaggtomte Large. White Cap/ White Hair. Skaggtomte Small. Grey Cap/ Grey Hair. Skaggtomte Small. Grey Cap/ White Hair. Skaggtomte Small. Red Cap/ Grey Hair. Skaggtomte Small. Red Cap/ White Hair. Skaggtomte Small. White Cap/White Hair. Lukas, Carl & Filip Grey Caps. Lukas, Carl & Filip Red Caps. Valter White Cap White Hair. Vera White Cap/ White Hair. Verner White Cap/ White Hair. Viktor White Cap/ White Hair. Rainbow Hen Candy Floss Pink. Rainbow Hen Lemon Puff Yellow. Sign. Do Not Disturb! Tiny Grass Dreaming. Sign. Dont Climb on Roots, Troll Will Bite! Sign. Frog Parking Only, all others will be toad! Sign. I am currently away with the Faeries. Sign. Tomte/Nisse enchant this spot. Sweet Pea Nisse Candy Floss Pink. Nisse children Green with Red Heart. Nisse children Red with White Spotted Heart. Nisse Children White with Red Spotted Heart. Sweet Pea Nisse with Flower. Nisse / Tomte Live Here Signs. Nisse Egg Cup And Cosy. Home / STORE / Asas Tomtebods / Tomte / Nisse. / Olga. 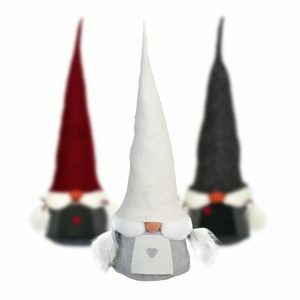 Olga is our largest female gnome (80 cm), she is married to Olle. The body is sewed in frieze and the nose and cap are made with tangled wool. The beard is made from genuine sheepskins that vary from straight to curly and may vary in many different colors. The color of the cap is either red, grey or white.